Pilates exercises can help you create a healthy spine. Follow the back stretching exercise workout I have listed below to get all angles of stretch for the spine. Extending, flexing, bending, and rotation will keep your spine young and healthy for years to come. This is a great back stretching exercise for all kinds of back conditions. It helps to stretch the abdomen and front of the spine while extending and strengthening the muscles of your upper and lower back. Begin lying on your stomach and then inhale as you press yourself up keeping your pelvis on the mat. Exhale to release back to start slowly. 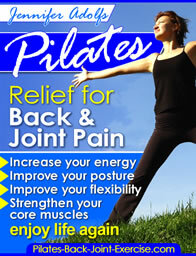 Check out this Pilates for Healthy Back and Joints DVD! This Dvd will show you how to do stretches and core strengthening exercises for your whole body. This back stretching exercise is good at moving in and out of back flexion and back extension to loosen up the lower back muscles. Exhale as you press into your hands tucking your tailbone down between your thighs arching your back up like a cat and then inhale as you release your tail and lengthen out through the crown of your head. You can also wag your tail side to side to work the side oblique muscles as well. Check out more detailed description of the Cat Stretch here. It is a great exercise to flex and extend the spine while releasing tension. Move in and out of your stretches slowly and deliberately, staying focussed on how your body feels, your form, and any discomfort. Stretch to the pain but not into it! You should feel a slight discomfort when you stretch. Like the saying..."Oh, it hurts so good." I love stretching on the Pilates Reformer as you get the added spring tension from the machine. The Mermaid on the Reformer is a great way to bend and stretch the muscles of the thoracic spine and side obliques. I use one spring tension and press out with an inhale, then exhale to bend from the ribs reaching out more. Inhale to sit tall lifting your chest back up and then exhale as you bring the carriage back to the starting position. This is an easy way to release the spine and open the chest at the end of the day. Work slowly into more stretch as you go with this one. Lie on your back with your knees bent and drawn together, arms out to the sides. Feet are together and flat on the floor. Inhale as you begin to sway the knees to one side, exhale to stay there and stretch. Keep your shoulder blades on the mat, but feel the waist and ribs roll off. Inhale again and then exhale as you draw your knees back to the center feeling the muscles at the waist pull them back. Repeat to each side 3-5 times. If you have acute or chronic back pain or disease some stretches may not be appropriate for you to perform. Please check with your physician to find out which ones you should avoid. The new Pilates ebook available here outlines appropriate stretching and strengthening exercises for certain back and joint conditions. Find more back stretching exercise, as well as other back exercises by going here.